The Third District Appellate Court recently overruled the dismissal of a Kankakee will contest complaint, providing clarity on who has standing to file a will contest petition. Eugene Lay died on January 29, 2016, having executed a will just one day prior. In re Estate of Lay, 2018 IL App (3d) 170378. In that will, Lay left his entire estate to Delbert Miller, who along with his daughter was managing some of Lay’s financial affairs. Lay executed a prior will in 1979 in which he left $2,000 to Miller, but otherwise left the entirety of his estate to his wife, or if she predeceased him to his wife’s brothers and sisters – including the plaintiff, Beverly Ann Bateman Kelton. Kelton filed a complaint to contest Lay’s 2016 will in the Circuit Court of Kankakee County, arguing that the will was executed as a result of Miller’s undue influence on him and was therefore invalid. Kelton alleged that Lay was suffering from lung cancer when he executed the will and may have been receiving palliative treatment in hospice care, and that he was suffering from various mental and physical infirmities and illnesses. Additionally, Lay was disoriented and was weak to respond over the telephone when Kelton called him two days before his death. The complaint noted that the 2016 will did not provide for Lay’s own family nor for Kelton, whom he had treated like a sibling, and that the will was not published or witnessed by two independent persons because one of the witnesses was Miller herself (which is not allowed). Miller moved to dismiss the complaint on the grounds that Kelton did not have standing to sue. The circuit court granted the motion to dismiss, accepting Miller’s argument that Kelton lacked standing because she was not one of Lay’s “heirs,” and that her status as a legatee under the 1979 will was insufficient to give her standing. Miller’s motion was based on a confusing 2004 case which has now been clarified. In In re Estate of Schlenker, 209 Ill.2d 456 (2004), the Illinois Supreme Court held that a decedent’s daughter had standing to contest her father’s will even though she had been expressly disinherited in three prior wills. In the context of a will contest complaint, standing to sue is derived from the Probate Act of 1975, which requires that one be an “interested person” in order to file a will contest. This means that a will contest plaintiff must have or represent “a financial interest, property right or fiduciary status at the time of reference which may be affected by the action, power or proceeding involved, including without limitation an heir, legatee, creditor, person entitled to a spouse’s or child’s award and the representative.” 735 ILCS 5/1-2.11 (West 2018). In Schlenker, even though the plaintiff was the decedent’s daughter and therefore had standing as an heir by virtue of the plain language of the above statute, the Court went on to discuss the fact that the will for which admission to probate was being sought contained a revocation clause. A revocation clause is a statement contained in a will by which a person revokes all previously-executed wills. The Schlenker court noted that the plaintiff had standing to sue not only because she was an heir, but also because the revocation clause arguably revoked all of the prior wills in which she was disinherited. The Third District in Lay correctly noted that this entire discussion was "dicta" – that is, irrelevant to the question presented to the court and therefore not binding precedent. 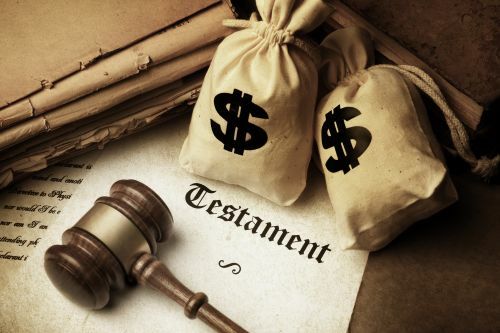 It determined that Kelton alleged in her complaint that she was a named beneficiary under a will executed in 1979, which was in effect up until the day before Lay’s death, and that the 2016 will was executed while Lay lacked testamentary capacity. She therefore had standing to contest the will because she had something financial to gain if she prevailed, or something to lose if she did not. If you believe that a loved one was the victim of pressure or undue influence in executing a will, contact Matthew Hess of Hess Law Firm today to see if you have rights to be defended at (312) 532-6860.12) 532-6860.